Let’s say you have a small image and you want to make it big. Perhaps you lost the larger version, or perhaps there never was a larger version. If you go to a normal photo editing program, like Photoshop, and try to enlarge the image, you’ll probably be somewhat disappointed. The editing program is likely to use either bilinear or bicubic interpolation to create the missing pixels in the enlarged image. The problem is that they’re looking rather naively at just the neighboring pixels when they create a new pixel. Obviously, they can’t magically “enhance” their way into adding new information to the image, but neither are they being clever about using what data is available. Thus, the enlarged image is rather soft and blurry. So what can be done? Unfortunately, Blurity isn’t well-suited for enlarging photos. The problem of enlarging photos, called “superresolution”, is related to the problem of removing blur from photos, called “blind deconvolution”, but not in a way that makes Blurity useful for enlargement. Instead, we need a different type of specialized tool. One of the most interesting and successful approaches takes advantage of the fractal nature of a natural image. In particular, visual elements are repeated within the image at different scales. This is important for two reasons. This is an extreme example, but almost all images have some degree of repetition. 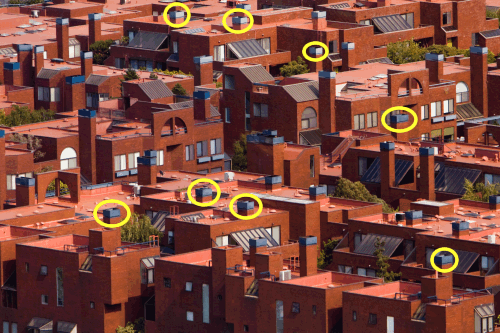 Notice how the yellow circles enclose what appear to be multiple copies of the same chimney. This repetition can be used to create a higher-resolution version of the chimney. First, the visual elements are likely to be repeated within the image at sub-pixel misalignments. In essence, the higher-resolution version of that repeated visual element has been sampled multiple times, which provides enough data to reconstruct a model of the higher-resolution visual element without directly observing it. The extra sampling also enables the removal of noise and compression artifacts. Inferring the latent high-resolution version of the patch from a variety of slightly differently sampled lower-resolution versions of the patch is the essence of classical superresolution. Second, the visual elements at different scales can be used directly in the resized image. For example, a circle might appear repeated in the small version of the image at multiple scales. A large scale of that circle could then be used in the enlarged image as a replacement for a small scale circle. At the moment, most of this technology is limited to the lab. A paper by Glasner et al. called “Super Resolution From a Single Image” includes some great examples of state-of-the-art image enlargement. Happy enlarging, and don’t forget Blurity if you just need to remove some blur. © 2019 Nesota LLC. Theme: Ari by Elmastudio.